In India, it is quite rare to find Brussels sprouts. 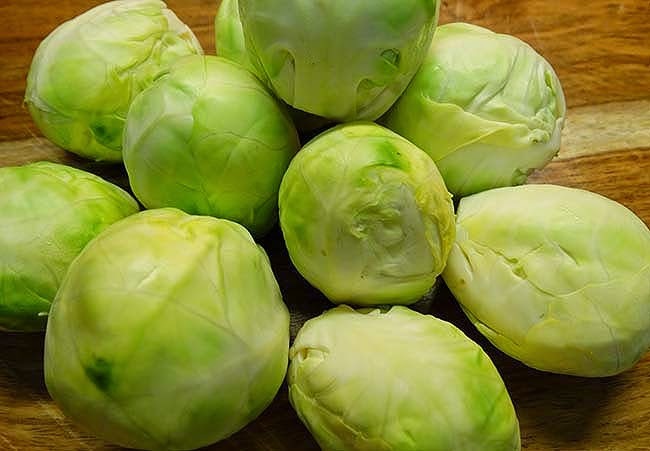 For several months now, a farm in the South of Goa offers Brussels sprouts regularly in my favourite supermarket so I wanted to find a way to make them edible for my men and me. When I was a kid, honestly, I hated Brussels sprouts. I remember them as extremely bitter. But this vegetable is so healthy, that I don’t want to ignore it. Brussels sprouts belong to the cruciferous vegetables that work better when they are steamed. Cooked in a steamer, they bind better with bile acids, lowering cholesterol levels. However, the flavour of these sprouts needs a strong counterpoint. Crispy fried garlic in butter delivers this. You can prepare this dish in ten minutes what is a big plus for me. I love vegetables, but cleaning and chopping them tends to be a chore. I always get angry when I watch the chefs on TV just chopping vegetables without cleaning and washing them. A big part of cooking goes into this work and I feel slighted when the TV cooks just ignore this part of the job. Clean the Brussels sprouts. Remove the outer leaves, cut away the dry end of the stalks and halve them. Check that there are no insects hiding in the tiny heads. Wash them and let them sit for about 10 minutes. This helps to develop their health benefits. 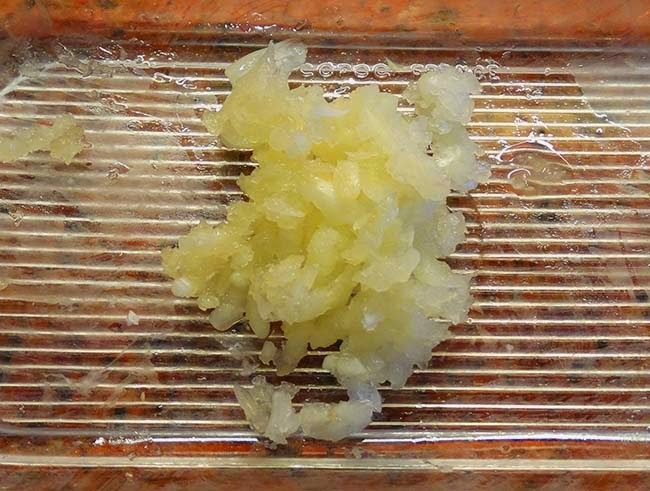 Clean and mince the garlic cloves. I love garlic so I use it generously. If you are not so keen on garlic, reduce the amount. Let it oxidise also. I use a foldable stainless steel inset that fits into any pot. 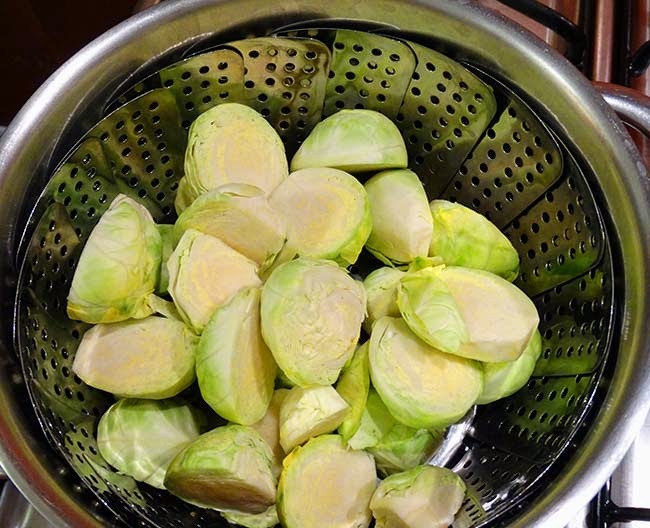 Place water under the steamer, add the Brussels sprouts, close the lid and let it bubble. Be careful when you open the lid. Escaping steam can cause terrible burns. 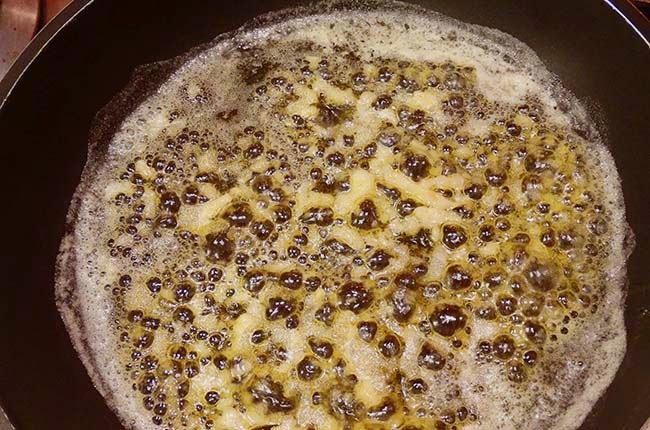 While the Brussels sprouts are steaming for five to 10 minutes, melt the butter in a small pan. Add the garlic and fry it over medium heat until it turns golden yellow and crispy. Be careful not to brown it too much. 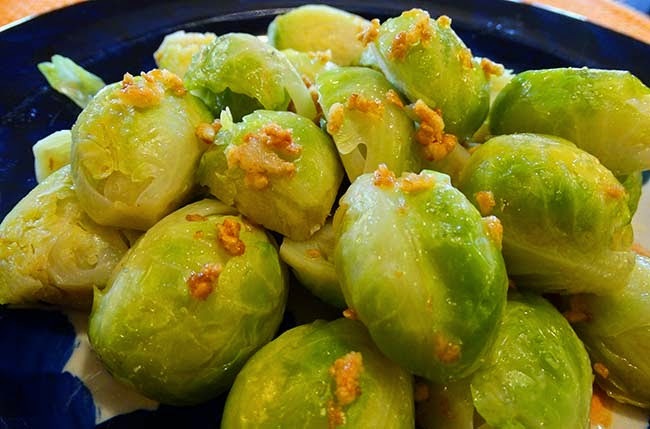 Toss the Brussels sprouts in the garlic butter, season with salt and pepper according to your taste and sprinkle the sesame seeds over the top. After the holidays, let's get rid of the pounds!